All weathered face and tired posture, Cate Blanchett pushes a trolley through a desolate urban space. With immaculately coiffed hair of blazing copper and immense poise under blazing studio lights, she reads the news like a seasoned professional. Sporting kohl-rimmed eyes and cropped locks to match, she oozes a punk-rock attitude in a grimy pub. The picture of conservative suburban domesticity and harmony, she sits down for a sumptuous dinner with her obedient family. A broker working as just another cog in an interpersonal financial system, a CEO holding court with an amenable crowd at a private party, a puppeteer painstakingly perfecting her own miniaturised likeness, a choreographer crafting an otherworldly dance performance, a dedicated reporter caught in the rain (or is she?) — the characters keep coming across 13 distinctive vignettes, with Blanchett inhabiting each and every one convincingly and with conviction. Looking the part isn’t the entire point of the Australian actor’s collaboration with German video artist and filmmaker Julian Rosefeldt, however, though she always does. Nor are the authentic surroundings that place her varying guises in a garbage incineration plant, a lab, a funeral, a classroom and more, all realised from places throughout Berlin with exacting and striking aesthetic precision. Rather, it’s the combination of person, place and ideology that drives the feature; the project’s name may refer to the singular, but Manifesto contains multitudes. From surrealism and minimalism to creationism and futurism — and encompassing everything from architecture to performance to filmmaking — Manifesto compiles a mass of 20th century art moments around them into a single ambitious and arresting effort, offering not only a collage of creative thinking, but manifestations and contextualisations as well. 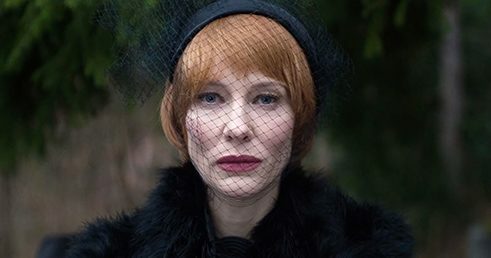 The words of Karl Marx, Andre Breton, Claes Oldenberg, Jim Jarmusch, Lars von Trier, Werner Herzog and others flow from Blanchett’s mouth, with her vast range of roles all posed as though they were simply speaking in an ordinary situation, whether muttering to themselves, stepping up to a gig microphone, reading a eulogy or instructing a room full of children. Understandably, the end result doesn’t make for standard viewing; evolved from Rosefeldt’s gallery installation of the same name, it assaults the audience with both concepts and their conceptualisation. Indeed, the film is a playful gambit built upon uttering and toying with serious tomes, and always remains aware of that fact, as it does of its “choose your own relevant section” function. Equally immersing its chosen ideology within the everyday and making it stand out is the feature’s aim, just as dictating ways of thought and living while reaching towards the helpful and utopian shines through in the movie’s chosen passages. Accordingly, noting the content’s many juxtapositions — in and between its texts, individual scenarios and characters — and parsing its similarities is to experience rather than merely to witness, with the insights gleaned and themes resonating likely to change from person to person. In his film 'Manifesto' Rosefeldt shows that we all gravitate to different lines of thinking | © Manifesto That each viewer will take their own path through Manifesto’s assemblage of manifestos, and take away their own meanings, may sound like an easy answer; however, as academic as it is artistic, the film is built to both embody and elicit that reaction. In depicting a variety of people all becoming and espousing different creeds, Rosefeldt shows that we all gravitate to different lines of thinking — even if we’re all ostensibly similar, as the reality that Blanchett’s lurks beneath each character makes inescapably plain. And, while the feature proves an undeniable acting showcase for the two-time Oscar-winning Australian tour-de-force, drawing upon her famed chameleonic skills and drawing audiences in in the process, she pairs astutely with the project’s broader vision. Some segments work better than others, and some words hit home harder over their counterparts, but the display of bravura from Manifesto as a piece of work, its star and its guiding hand makes an unshakeable imprint. Julian Rosenfeldt’s Manifesto screens at Brisbane International Film Festival 2017. Please check the links on the right hand column for more information and screenings.